Spiced Persimmon Bourbon Old Fashioned. 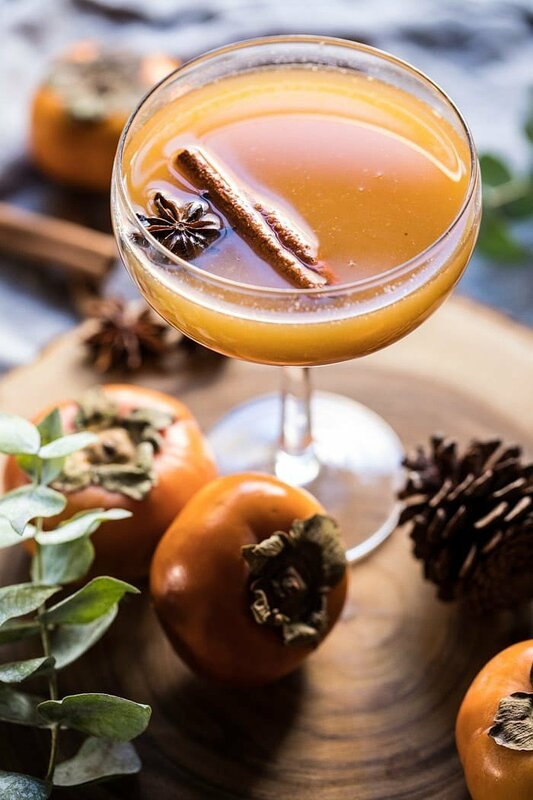 This Spiced Persimmon Bourbon Old Fashioned feels very fitting for the first Cocktail Saturday of November. 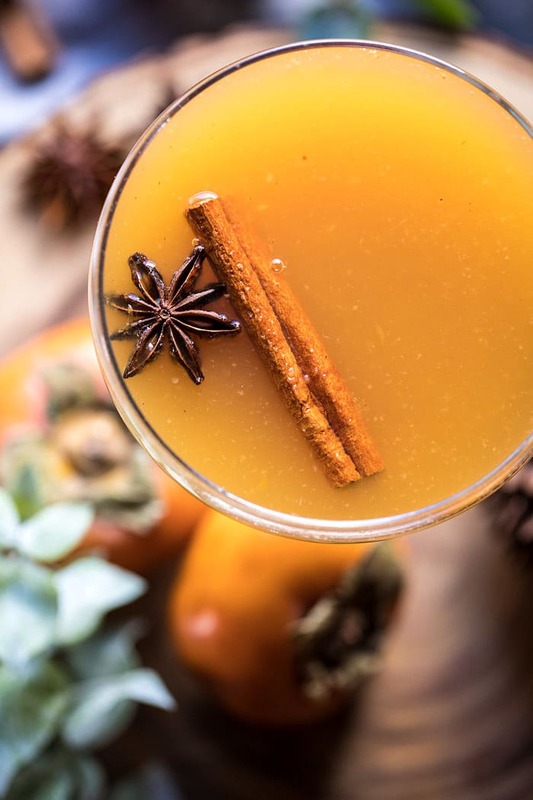 It’s the perfect warming drink for the cold fall and winter nights ahead. Ideal for cozying up with next to a roaring fire while the cold winds blow outside. I know persimmon’s are not the most popular autumn fruit out there, but I personally love them. The second I finally see them in the grocery store, come late October, I always buy a giant box full. It’s funny because the first time I ever tried a persimmon, I tried a very under ripe Hachiya persimmon and literally thought I was having an allergic reaction. It was horrible, made my throat so dry, and left an awful taste in my mouth. I didn’t understand why anyone would ever eat a persimmon willingly. 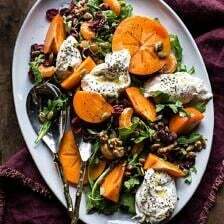 At first I thought maybe it was just a bad one and I needed to give it another try, so I continually kept trying, until I decided that the persimmon was a fruit that was just not for me. 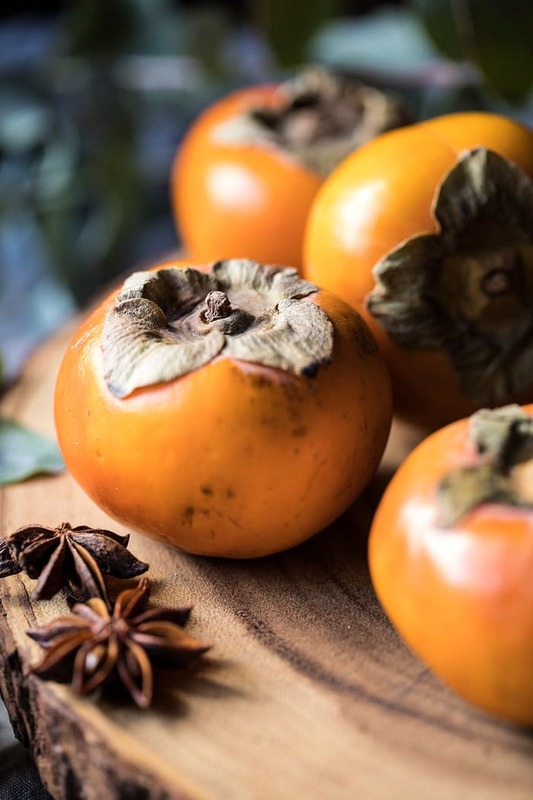 But then I did some reading and realized that Hachiya Persimmons can only be eaten when they are extremely ripe, super soft, and almost mushy. This is when they are sweetest…and actually edible. Anyway, long story short, I don’t ever buy Hachiya Persimmons. Instead, I go for the much more forgiving Fuyu variety persimmon, which is extra sweet and extra delicious. They’re similar to an apple in the way that they are ripe when firm and have a little crunch to them. I love adding them raw to salads, see this salad and this salad. 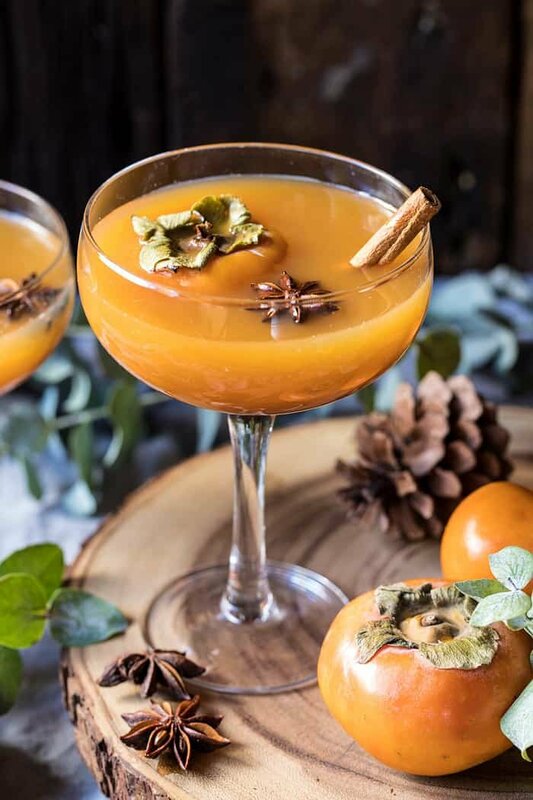 But this time, I decided I wanted to experiment with a persimmon cocktail, which I thought would be perfect for the fall. 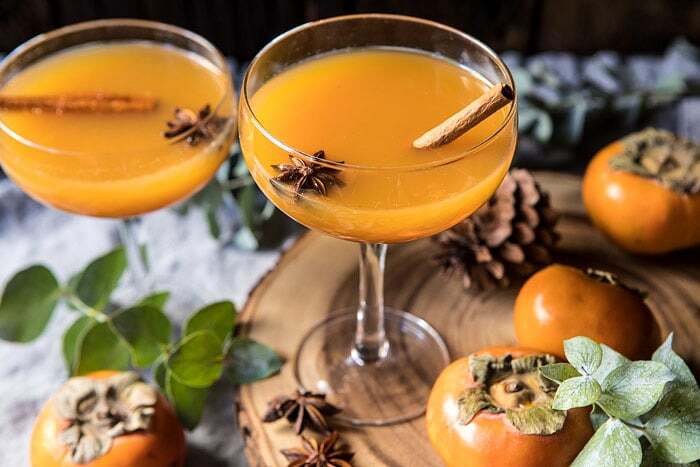 Enter this spiced persimmon old fashioned. 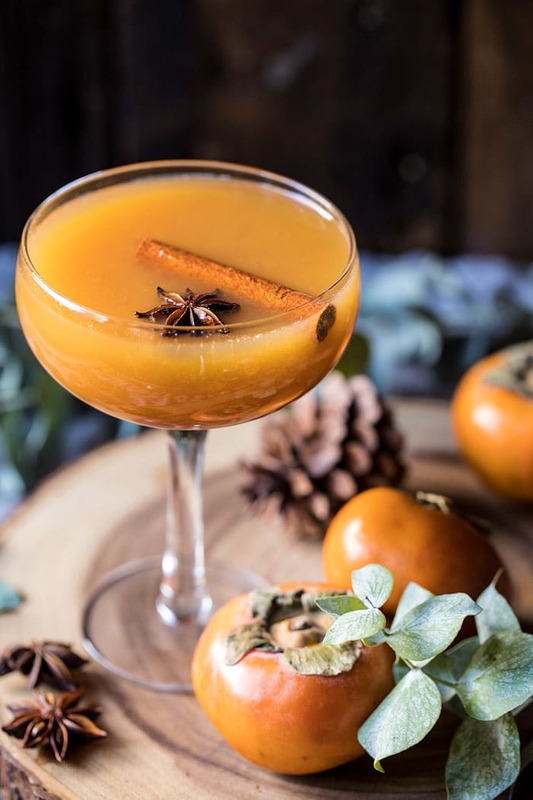 Made with a spiced maple persimmon puree, bourbon, sweet clementine juice, and a couple of dashes of bitters, the persimmon puree makes enough for about four cocktails. If you’d like to make this as a pitcher style drink for Thanksgiving, just quadruple the amounts for the old fashioned. Top each glass off with some sparkling water (or ginger beer…that would delicious) and your Saturday night cocktail is complete. PS. aside from the drink’s delicious taste, I also love it’s pretty orange hue. So festive for this time of year…I know, I am seriously just so cheesy, but I love holiday everything! 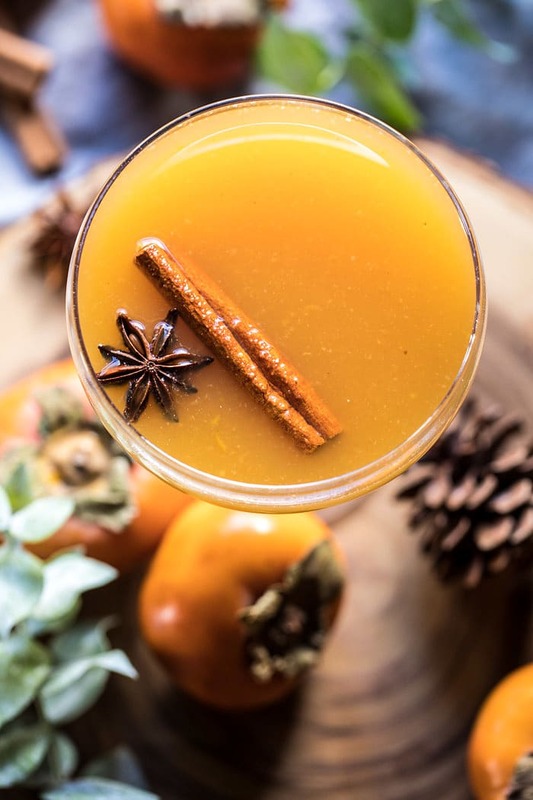 Made with a spiced maple persimmon puree, bourbon, sweet clementine juice, and a couple dashes of bitters, this is the perfect warming cocktail for cold fall or winter nights. 1. 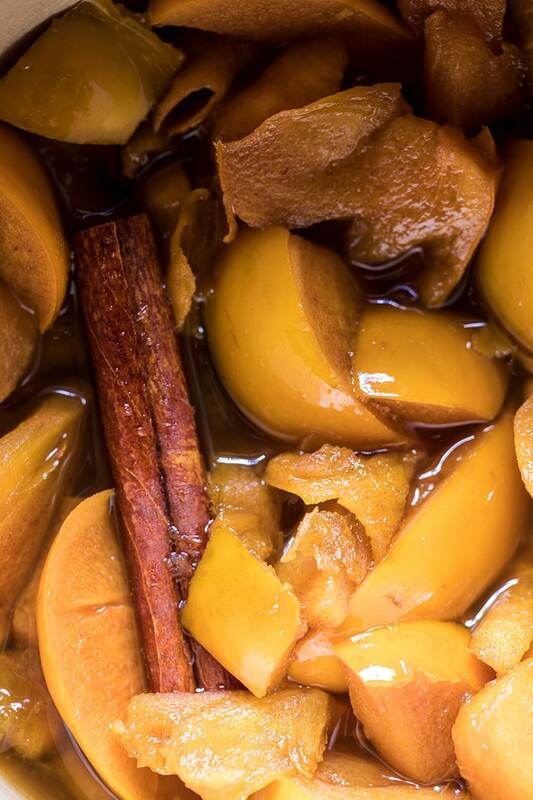 In a small pot, combine the persimmons, maple, 1/2 cup water, and 1 cinnamon stick. Set over medium heat and bring to a boil. Cook 5-8 minutes or until the persimmons are mushy and have released their juices. Remove from the heat. Remove the cinnamon stick and puree the mix. Let cool. 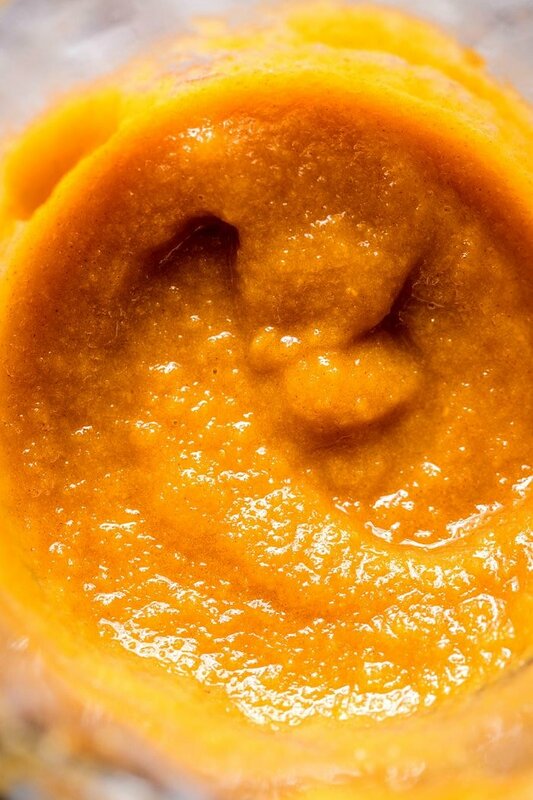 The puree will keep for 1 week in the fridge. 1. 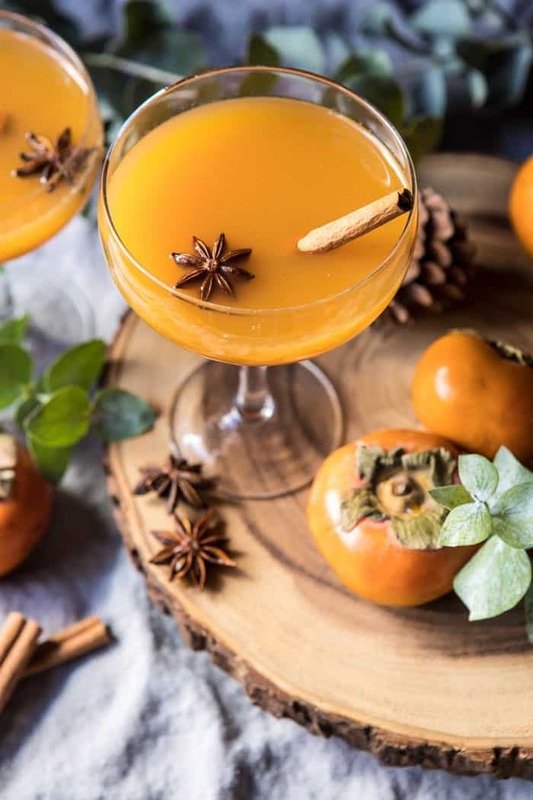 In a cocktail shaker, combine the bourbon, lemon juice, clementine juice, orange bitters, and 1-2 tablespoons of the persimmon puree. Shake to combine. 2. Strain into a glass. If desired top with sparkling water. 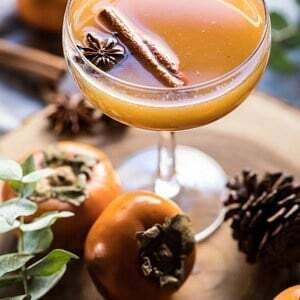 Garnish with cinnamon and star anise. Happy Saturday! See you tomorrow for a new post on our Studio Barn series. This drink is so pretty! 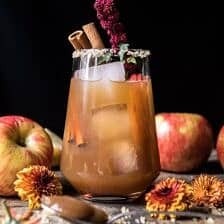 An old fashioned is already such a good fall drink, so i can only imagine how festive this version tastes! this looks gorgeous! i’ve got some bourbon that I’d love to use in this right now! never made anything with persimmon before but this look just beautiful! Yes try this! I hope you love it Georgie! Thanks! My sister and I grew up with a Japanese Persimmon tree hanging over our driveway. Never knew what type but they were about the size of golf balls and went from apple green to a mushy orange. We hated that tree because the persimmons were considered inedible and it was our job to clean all the rotten and smashed ones out of the driveway. We did finally find a use for them. The green persimmons made great ammunition to throw at cars coming down our street as we hid behind some bushes. That was hilarious until we misidentified a car and pummeled our preacher fathers car. Let just say we got pummeled with a spanking and our career in persimmon warfare was ended. I’m trying this recipe to see if I can have a pleasant experience with a persimmon! It is such a great drink to warm up with! Seriously, I love both drinks so I totally think you should try both! Thank you Kristin! Great cocktail! I made a large batch so tripled the puree recipe. the persimmons didn’t totally break down so i blended them after removing the cinnamon sticks with an immersion blender. I have a ton of puree left over in the freezer! we found it too lemon forward so dropped the lemon from our second batch. 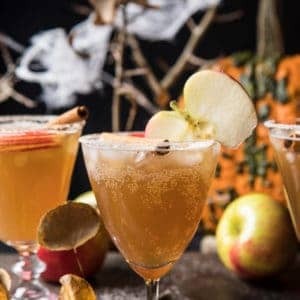 great fall flavors! Thank you Kristine! I am so happy you loved this drink! I just made a test run of this for our Thanksgiving tomorrow. It’s a little on the tart side, maybe the amount of lemon and the no so sweet clementines I bought. I might dial down the lemon a tad and try with the ginger beer for a little extra spice and sweetness. Do I add ice to the shaker? I’ve only had an old fashioned once before and it was served with a large ice sphere. I’m definitely glad I found this recipe! Yum! I would love to make a batch of these for Friendsgiving. 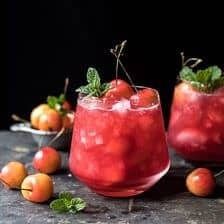 What would the best way to make this as a large batch cocktail? Made this last night – sooo delicious! Highly recommend!